The world’s largest shipper A.P. Moller-Maersk sounded the alarm on Wednesday by announcing there would be a tremendous “price to be paid” for President Trump's trade war as global demand has now plummeted to its lowest level in more than two years. Chief Executive Soren Skou told the Financial Times that it expected global container trade to decline by .5% to 2% in 2019 and 2020 due to increased tariffs between the US and China. "The impact right now on US-China trade is that Chinese imports to the US have gone up and US exports to China have gone down...Obviously, there will be a price to be paid sometime in the first quarter . . . There will be no real impact until after Chinese new year [in February],” Skou said in an interview. The demand outlook for 2019 looks rather gloomy, as top US importers have been quickly stocking up on Chinese goods before new import tariffs take effect on January 01, this could mean that container demand plummets sometime between January and March 2019 - something that Skou warned about above. The US has introduced tariffs of 10% to 25% on $250 billion worth of Chinese imports, prompting Beijing to retaliate with tariffs of their own. Trump has threatened China with a full-blown trade war in 2019, a move that would crush the global economy. In August, we first reported that freight data via Goldman identified global trade momentum was slowing since late 2017, and that July readings suggested an alarming continuation, and in some cases acceleration, of this trend. The deceleration in shipping rates has closely tracked a tightening in global financial conditions, particularly evident in EM data, which in turn has largely been a manifestation of the ongoing escalation in the trade war. 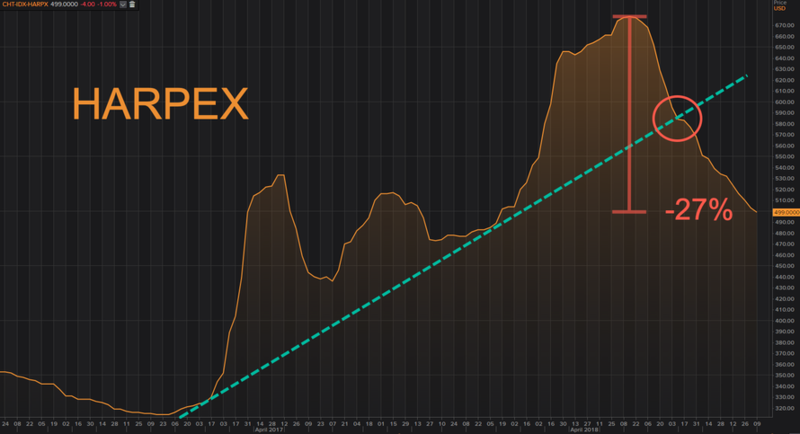 Earlier this month, we outlined even more evidence from Reuters shows the cost of chartering commercial ships has collapsed even further. More specific, rates for container ships have sunk 27% from a multi-year peak while raw material vessel rates have fallen 10% from a five-year high, adding to the mounting evidence that slowing global trade could soon usher in a worldwide recession around 2020. 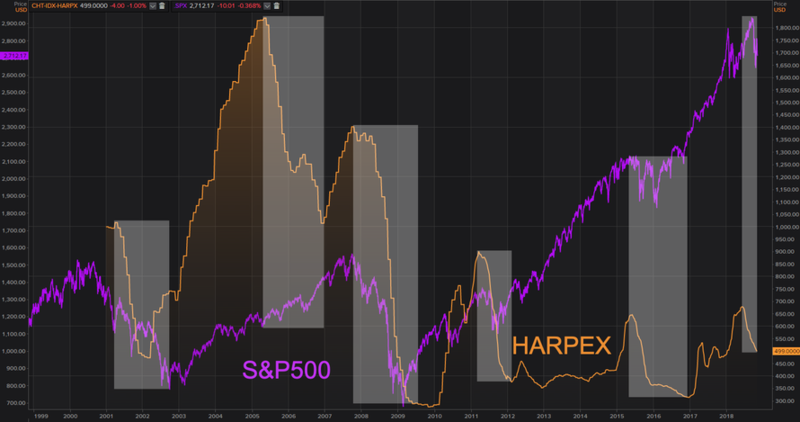 The Harper Petersen Charter Rate Index, which is published on a weekly basis, tracks rate levels in US Dollars of container ships, had dropped well over 27% from June when it was at a seven-year high to 499. And there you have it, the world's largest shipping company has proof that Trump's trade war with China could lead to economic turbulence in early 2019.